Well-versed in the challenges and expectations involved in commercial roofing installations, The Roof Authority team has become the region’s most respected and sought-after commercial roofing company, specializing in large-scale roofing projects. Because the seriousness and scope of a commercial facility are often accompanied by high levels of safety liability, it is imperative that you find a local roofing contractor that has the experience and knowledge to undertake such a comprehensive project. 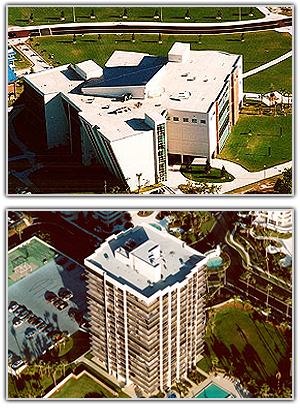 We provide the necessary expertise as one of Vero Beach’s leading commercial roofers. At The Roof Authority, our expert installation techniques and use of superior building materials actually exceed local building codes. Our team excels in both new construction installations and commercial roof replacement, and our crews place excellence as a daily standard, setting the bar for the entire industry at its highest possible level. Backed by our manufacturers’ 20-year “no dollar limit” warranties, every roof we install or upgrade is guaranteed to satisfy. Providing high-caliber service to each and every one of our commercial and industrial clients, we keep our focus consistently aimed at unparalleled workmanship. Find out why so many of Vero Beach’s roofs were installed by our team and call for your free project estimate today. We are the commercial roofing company to trust. Contact us today. We proudly serve the Fort Pierce, Vero Beach, Indian River County, Martin County, and St. Lucie County areas.